Looks like Preity Zinta is too bored of all out glamour roles and now concetrating full on character roles. We have already seen her sober avatar in movie The Last Lear. Here is another one from movie 'Heaven on Earth'. This Deepa Mehta movie traces the pain and suffering of women who go to foreign shores for a better future but end up on the wrong side of life. 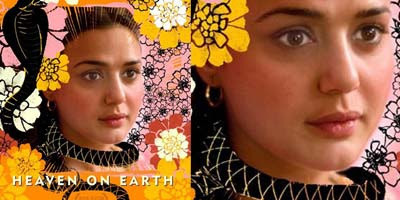 Preity Zinta plays a plain jane wife on the foreign shores and her sufferings.